Come to the Senior Center to register for Pre-Season Pass sales and swim lesson registration. 2pm to 4pm. Please bring your calendar so we can register you for the correct class. 1075 S. Congress St. Right next to the Pool. Help spruce up the pool before we open. Please bring gardening tools, wheelbarrows and lots of elbow grease! Passes and swim lessons can be purchased during this time. Tonight is the first night we are open! Interested in what it takes to be a lifeguard? If you are aged 12-14years old and can pass the Super Swim Test then this class is for you. You will practice CPR skills, use of safety equipmnet and saves. Bring whatever you need to be in the water. A light lunch will be served after 11:30am. Plan on being picked up after 12pm. Those participants that show interest and are good at the practice skills may be asked if they would like to assist on our busier days, events and lessons. They wlll shadow and assist guards. Saturday lessons begin. Beginner and Advanced Beginner only. Registration and payment are required ahead of time and can be done at the pool. Classes are on June 15, 22, and 29th. July 13, 20 and 27th. For more information see the Swim Lesson tab. June 15 START OF FULL SEASON! Session One Swim Lessons Begin. You must register and pay ahead of time. Register and pay at the pool. For more information, see the Swim Lesson tab. Full water execise begins. No swimming ability needed. For further information see the Water Exercise tab. ADULT SWIM LESSONS BEGIN. Lessons are on Monday and Wednesday. Registration and payment are required ahead of time. Registration and payment are made at the pool. The pool is open only to Season Pass holders from 6pm to 8pm for games, fun and pizza slices. Pizza will be served around 7pm. Adult guests and youth guests may come but must come with Season Pass Holders. Cost for guests are $5 and $3. Come watch the Otters Swim team swim against Lincoln. Meet starts at 9am. Session Two Swim Lessons Begin. You must register and pay ahead of time. Register and pay at the pool. For more information, see the Swim Lesson tab. Come watch the Otters Swim team swim against Forest Brooke. Meet starts at 9am. Come watch the Otters Swim team swim against Buhr. Meet starts at 9am. Baby Bubbles are on Sundays July 21 and 28 and August 4, and 11. Registration and payment are required ahead of time and can be made at the pool. For more information see the Swim Lessons tab. Session Three Swim Lessons Begin. You must register and pay ahead of time. Register and pay at the pool. For more information, see the Swim Lesson tab. The pool is open only to Season Pass holders from 6pm to 8pm for games, fun and ice cream. Ice cream will be served around 7pm. Adult guests and youth guests may come but must come with Season Pass Holders. Cost for guests are $5 and $3. Session Four Swim Lessons Begin. You must register and pay ahead of time. Register and pay at the pool. For more information, see the Swim Lesson tab. NOTE THIS SESSION IS ONLY ONE WEEK LONG AND CLASSES LAST ONE HOUR. The pool is open only to Season Pass holders after we close at 8pm for a movie on the pool deck. We will provide popcorn. You provide your own beverages. Adults must stay with youth. Movie suggestions will be taken. Movie must be appropriate for young ages. Adult guests and youth guests may come but must come with Season Pass Holders. Cost for guests are $5 and $3. Join us for an end of the season potluck. Bring your dish to share, meat for the grill and a blanket to sit on. The pool will provide drinks and the grills. Bringing the library to you! The library will have activities on the pool deck between 5:30 pm and 6:30pm. All regular programming schedules and fees apply. Children can work individually or as a team to swim, bike and run through Recreation Park. Pick up your registration form at the pool. Besides being a lot of fun, this is one of our few fundraisers for the pool. Swim Lesson Session 4 Begins Register ahead of time at the Pool for placement in a class. Swim Lesson Session 3 Begins Register ahead of time at the Pool for placement in a class. A chance for kids to learn to play water polo. Must be able to pass the swim test and tread water in the deep end. Swimmers need to be accompanied by an adult. Our home team of Ypsilanti Otters will swim against Barton Hills. The stroke of the meet is a free style-mid distance. Swim fast, Otters! Swim Lesson Session 2 Begins Register ahead of time at the Pool for placement in a class. Watch the Ypsilanti Otters swim against the swimmers from the Ann Arbor Y. The stroke of the meet is the breast stroke. Go Otters! Join us Saturday, June 23rd 9am-1pm to raise money for the Rutherford Pool! 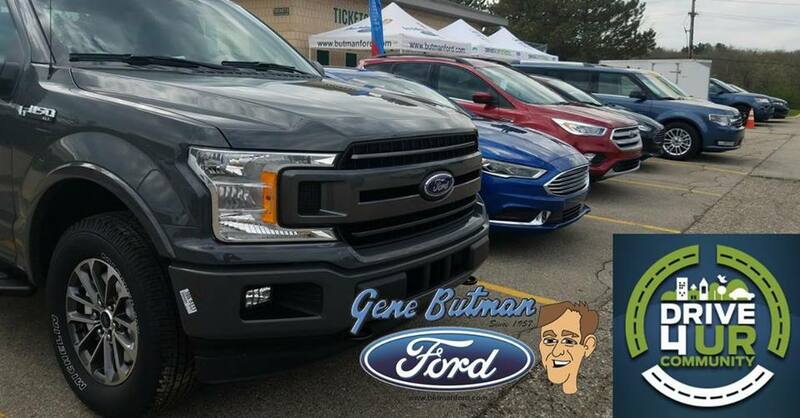 We will have a variety of Ford vehicles available for you to drive. $20 is donated for each person who test drives (must be 18 or older). Rumor has it that there will be donuts in the am and hot dogs around noon. Maybe even a bounce house to entertain the kids while you arrange to take a ride. This will be held at Rutherford Pool. If you live in the neighborhood, please consider walking on over. Some street parking is available. The lot will have limited space. Adult swim lessons Monday and Wednesday 5:15pm-6pm. You must register for classes ahead of time. Water exercise class begins officially, today. Please join us on M/W/F from 12pm to 1pm and Tues/Thurs 5pm to 6pm. You do not need to know how to swim. Classes are held in chest deep water. Warm up, cardio and resistance work all put to music. Have fun while exercising under the sky. Swim Lesson Session 1 Begins Register ahead of time at the Pool for placement in a class. Jr. Lifeguard Training is designed for swimmers, aged 11-14 that can proficiently pass the swim test. Swimmers will explore skills in which lifeguards need to be trained. After training in the pool, swimmers will be treated to a pizza lunch. Successful swimmers in the Jr. Lifeguard training may have the opportunity to shadow Rutherford guards throughout the summer and gain additional knowledge and experience. Swimmer must register ahead of time so that we can access swimming ability and plan for supplies and staffing.